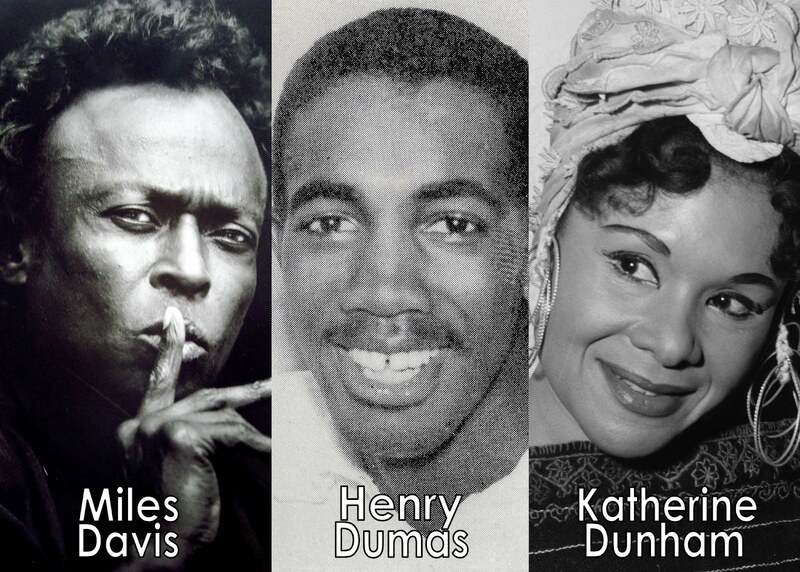 "Da-Dum-Dun," a multi-arts festival in honor of musician Miles Davis, writer Henry Dumas, and dancer and choreographer Katherine Dunham, will be held at 6:00 p.m. Friday, May 25 in Room 2083-84 of Bldg. “B” on the SIUE-ESL Higher Education Campus, 601 J.R. Thompson Dr. in East St. Louis. The free event will include music from the Bosman Twins; dance and percussion from the Sunshine Cultural Arts Center's Community Performance Ensemble; and "literary expression" from Drumvoices writers including Pacia Anderson, Michael Castro, Roscoe “Ros” Crenshaw, Angela Cureton, Byron Lee, Susan “Spit-Fire” Lively, Charlois Lumpkin, Patricia Merritt, Treasure Shields Redmond, Mary Z. Rose, Darlene Roy, Cheryl D. S. Walker, Dr. Lena Weathers, and Jaye P. Willis. The three honorees also will be the subjects of a "multimodal exhibit" from the Eugene B. Redmond/SIUE Collection. 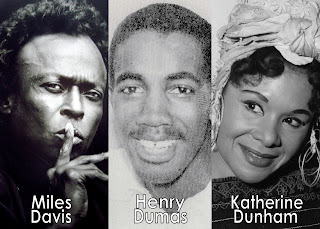 All three of the honorees are renowned creative figures associated in some way with the city of East St. Louis, and the event takes place the day before what would have been the 86th birthday of Davis. The trumpeter was born in Alton, but grew up in East St. Louis and graduated from Lincoln High School. Dunham, originally from Chicago, moved to East St. Louis in 1967 after an illustrious career and founded the performing arts school and museum bearing her name. Dumas, born in Arkansas and raised in Harlem, taught at SIUE-ESL’s Experiment in Higher Education in 1967 and '68. The celebration also will be a book release party for Drumvoices Revue, a 700-page volume co-published by the Eugene B. Redmond Writers Club and SIUE, co-sponsors of the event. Drumvoices Revue includes contributions from more than 200 writers, including Maya Angelou, Derek Walcott, Amiri Baraka, Andrea Wren, Gwendolyn Brooks and Richard Wright. Book sales and autographing will open and follow the event.